It can be a challenge to find a whole packer brisket in this area. So, When I get one I have to think carefully to decide what to do with it. A brisket makes corned beef, pastrami, Montreal smoked meat and several other dishes. When I got this one, a basic smoked brisket called to me. 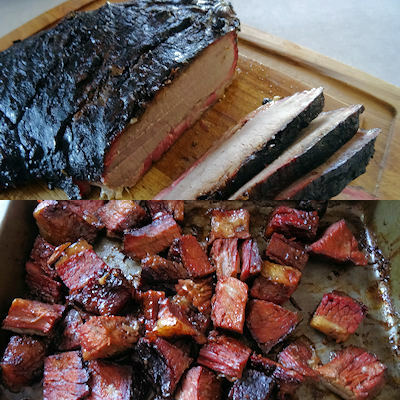 So, I smoked a brisket and made burnt ends out of the point. What is the point you ask? A whole brisket has two parts. One is a narrow flat slab of beef called the flat. Above it is a thick fat layer. On top of the fat layer is a flattened pyramid shape of beef called the point. The point is fattier than the flat. You can cook and slice it just like the flat but the grain runs in a different direction and it will be a fattier slice. I chose to cook the brisket all at once and then separate the point and make burnt ends out of it while the flat rested for slicing. Some people think the best part of a brisket cook is the burnt ends. I started by trimming the thickest fat off the brisket. On the bottom (non fat layer) side, there is a large knot of fat near the thin end. I trimmed it down to about 1/4 inch thick. I then trimmed the fat layer on top to 1/4 inch thick. Some butchers trim this before you buy the brisket. I turned the brisket over and made 1/4 inch deep slices against the grain of the flat. It can be difficult to pick out the grain of the flat when the meat is cooked. By slicing parallel to these slices when the brisket is cooked, you will be cutting across the grain. I made a 3/4 inch deep slice all around the edges of the thick fat layer that separates the flat from the point. This will make it easier to separate the two sections when the brisket is cooked. I mixed the salt, pepper, garlic powder and onion powder together. I saved 10 ml (2 teaspoons) and rubbed the rest into the surface of the brisket. I let the brisket sit uncovered in the fridge overnight. 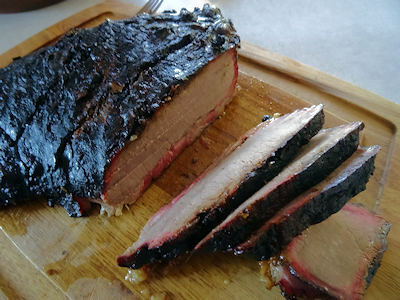 I preheated my Louisiana Grills smoker with oak pellets to 230 F and put the brisket in it to smoke for 4 hours. Bring the brisket in and put it on a large sheet of heavy duty foil. Fold the foil over and seal one end by folding the foil over several times. Seal the edge opposite the fold the same way. Add the beef stock to the pouch the brisket is in and seal the last edge. Put in the smoker and cook to an internal temperature of 195 F. Push a wooden skewer into the brisket. If it goes in like butter, it is done. If it doesn’t, continue cooking to an internal temperature of 198 F and retest. If it still doesn’t go in very easily, cook to 200 F and then 203 F. If you get to 203 F, it will be tender. I can not tell you how long this will take. Each piece of meat is different. Each smoker has different air flow. I have had it take between eight to ten hours after foiling the meat. There is often a period where the temperature stops going up called the stall and it can vary greatly. Just keep smoking until it is tender. Bring the brisket in. 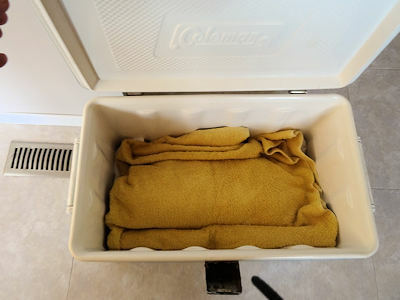 If it is more than two hours until dinner, Put some old towels in the bottom of a cooler and put the brisket in a pan on them. Cover with more towels and close the cooler. 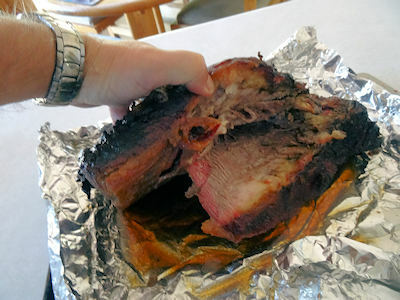 Two hours before dinner, take the brisket out of the cooler and unwrap the foil. Save any liquid in the foil. Measure out 125 ml (1/2 cup of the liquid). Don’t worry if you don’t have that much. Sometimes the foil punctures and you lose juices. Use a sharp knife to work your way through the fat layer separating the flat from the point. Re-wrap the flat in the foil adding any leftover juices to the foil package. Put the flat back in towels in the cooler. Cut the point into 1 inch cubes and put them in a roasting pan. Sprinkle with the 10 ml (2 teaspoons) of rub you reserved and toss. Mix the 125 ml (1/2 cup) of juices with 125 ml (1/2 cup) barbecue sauce. If you didn’t have enough juices, top them up with beef stock. Pour the mixture over the cubes and put the pan back in the smoker for 2 hours, stirring twice. Slice the brisket and serve the slices and burnt ends. You can fancy a brisket up with an injection, fancy sugary rubs and rich finishing sauces but this basic brisket is just so good. The flat is beefy and moist. The long cooking makes it tender. 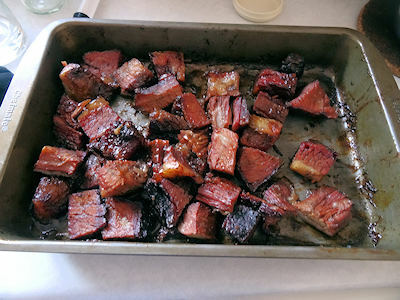 The burnt ends are full of flavour and have a great caramelized crust. Yes. Sometimes you just have to go basic. Trim the fat on the brisket to 1/4 inch thick. Cut 1/4 inch deep slices across the grain on the flat so will know which way to cut when it is cooked. Cut a 3/4 inch deep slice all around the fat line separating the point from the flat. Mix the salt, pepper, onion and garlic powders together. Set aside 10 ml (2 teaspoons) of the mixture for the burnt ends. Rub the remaining mixture onto the surface of the brisket. Preheat your smoker to 230 F. I use oak for this smoke. Smoke the brisket for 4 hours or until it has a nice browned crust. Wrap the brisket in foil and put the beef stock in the foil pouch. Seal the pouch. Smoke until the internal temperature is 195 F. Use a wooden skewer as a probe. If the probe goes in like butter, it is cooked. Keep smoking and probing until the meat is tender. If it is more than 2 hours to serving time, put the wrapped brisket in a pan. Wrap the pan and brisket in towels and put it in a camp cooler. Two hours before serving, take the brisket from the foil, reserving any juices. Measure 125 ml (1/2 cup) of the juices and set them aside. If you don't have that much juice, top it up with beef stock. Separate the flat from the point. Re-wrap with foil putting any excess juice in the foil. Wrap in towels and put it back in the cooler. Cut the point to one inch cubes and put them in a pan. Toss with the reserved rub. Mix the juice and barbecue sauce. Pour it over the cubes and put the pan in the smoker for 2 hours, stirring twice. Remove the flat from the cooler and slice against the grain. Serve the slices and burnt end cubes.